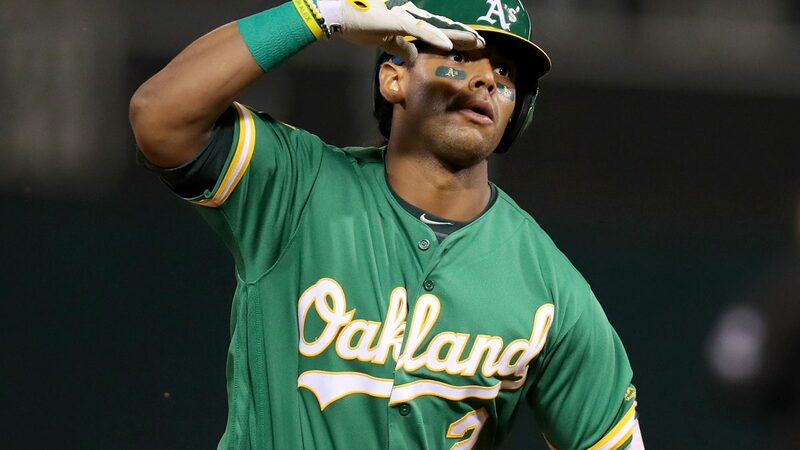 Three times before the seventh inning Friday night, an A’s fan waving a Portuguese Heritage Night sign was shown on the jumbotron emphatically throwing back 16-ounce beers. Perhaps it was the continued struggles of Lou Trivino that drove her to the keg. 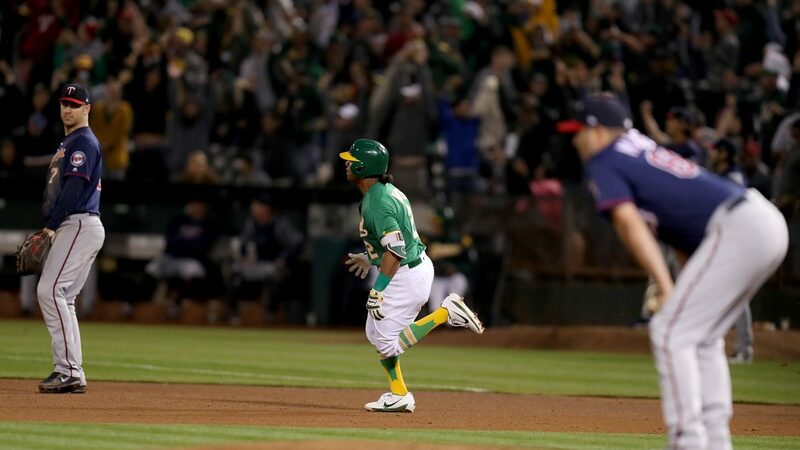 Either way, for her sake, one can only hope she was still coherent when the 10th inning rolled around and Khris Davis ended the night the same way he started it — with a homer. 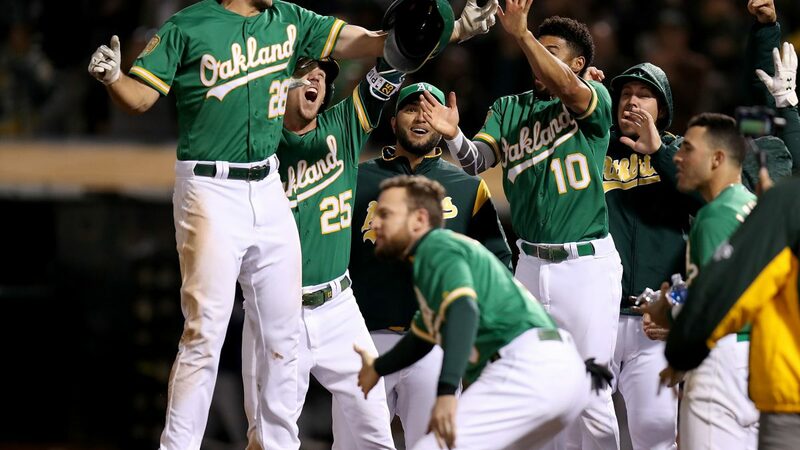 Behind a walkoff blast from Davis in the 10th, the Athletics (93-61) marched one game closer to their first playoff appearance in four years. 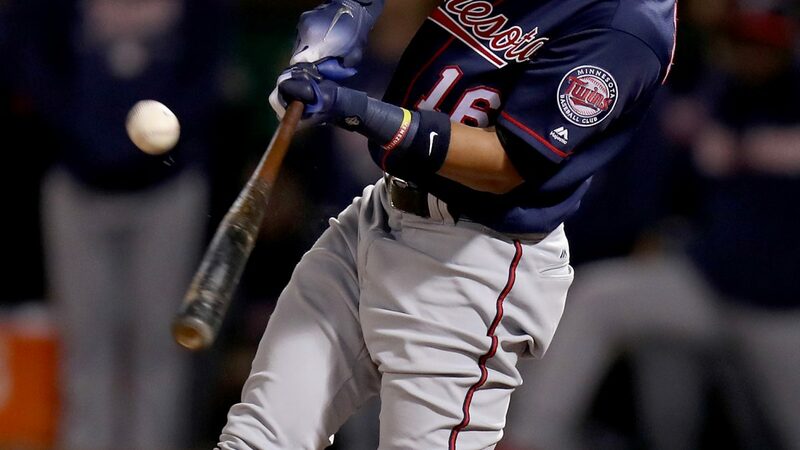 A comeback by the long-eliminated from contention Twins (71-82) preceded Davis settling things for good, 7-6. 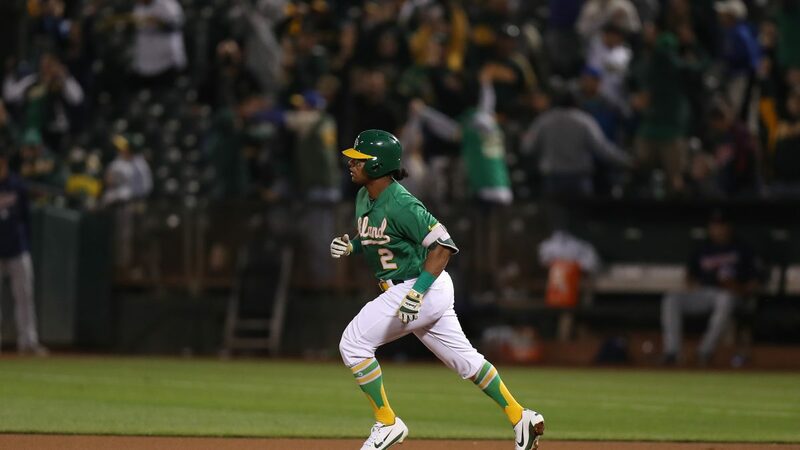 Oakland Athletics designated hitter Khris Davis (2) rounds the bases after hitting a walk off home run in the 10th inning as the Minnesota Twins fall the Oakland Athletics 7-6 at Oakland Coliseum in Oakland, Calif., on Friday, September 21, 2018. 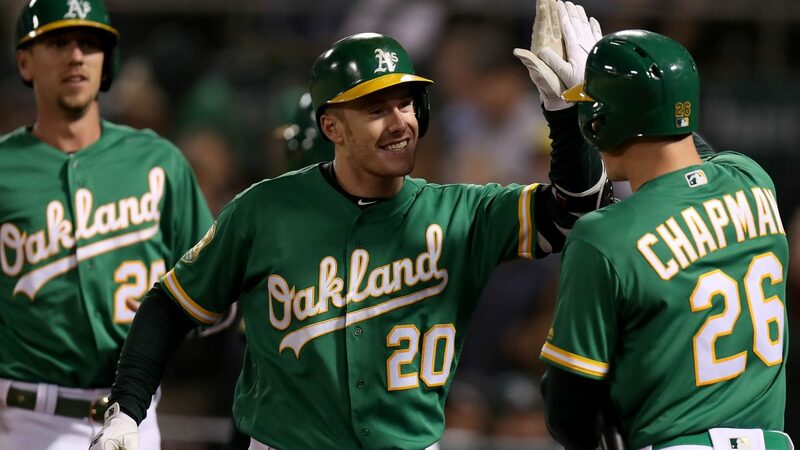 Davis has certainly meant a lot to the A’s. 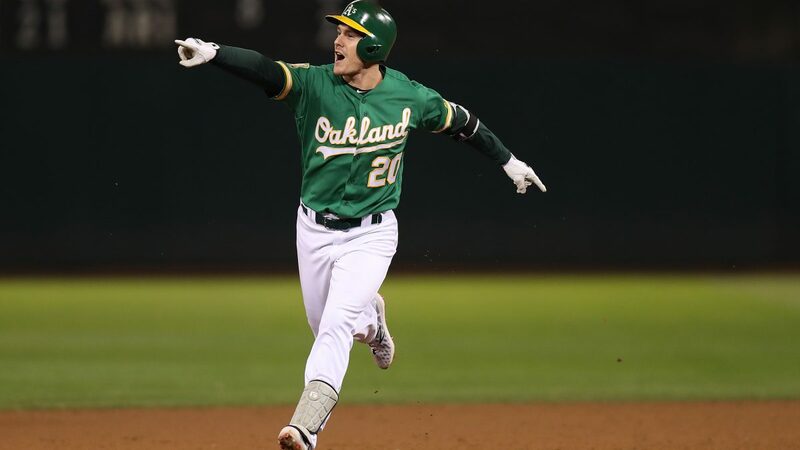 When one talks about “value,” and which player is most “valuable,” it’s impossible to leave the Oakland designated hitter completely out of the conversation. 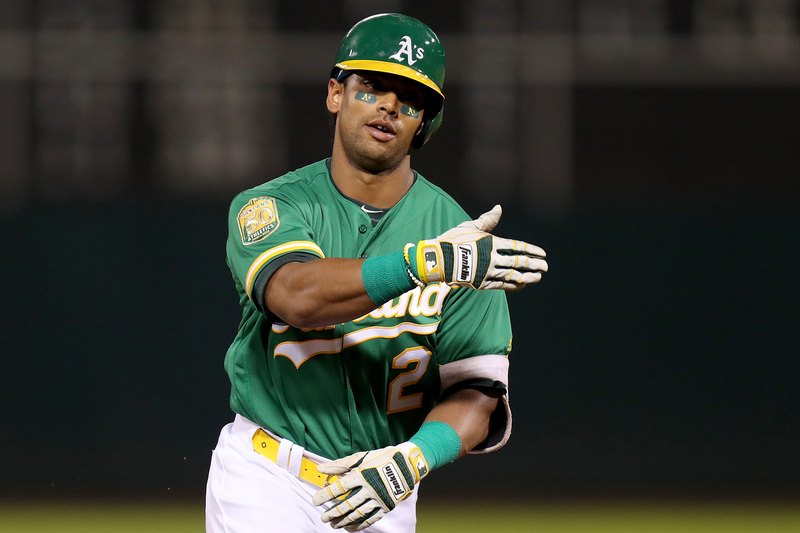 In A’s wins this season, Davis is batting .280 with 27 home runs and 80 RBIs. 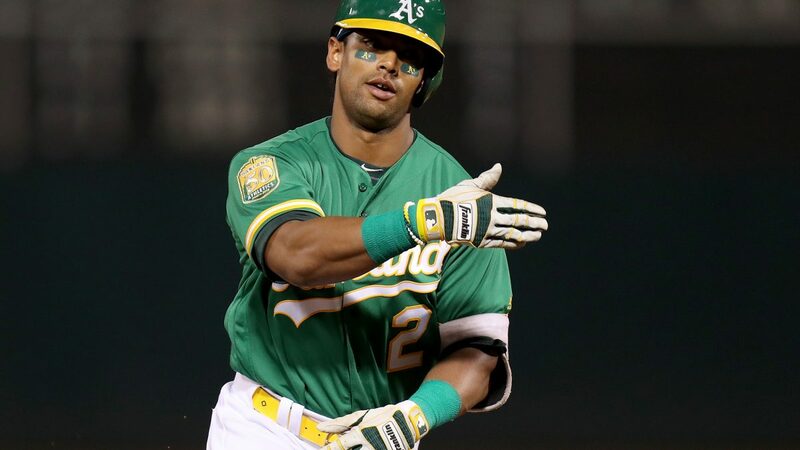 In losses, his average is .203, and he has driven in just 38 runs, though he has homered 18 times. He has had as much to say about the outcomes of his team’s games as any other player in the league. Not to mention, he now leads the home run race by four and is closing in on 50. 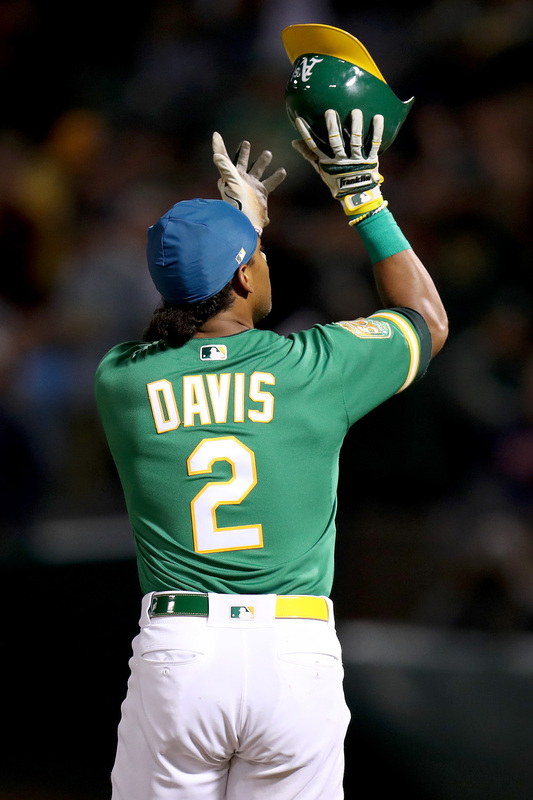 Davis began the scoring with his MLB-leading 44th homer, a two-run shot to right-center in the first inning. He smashed No. 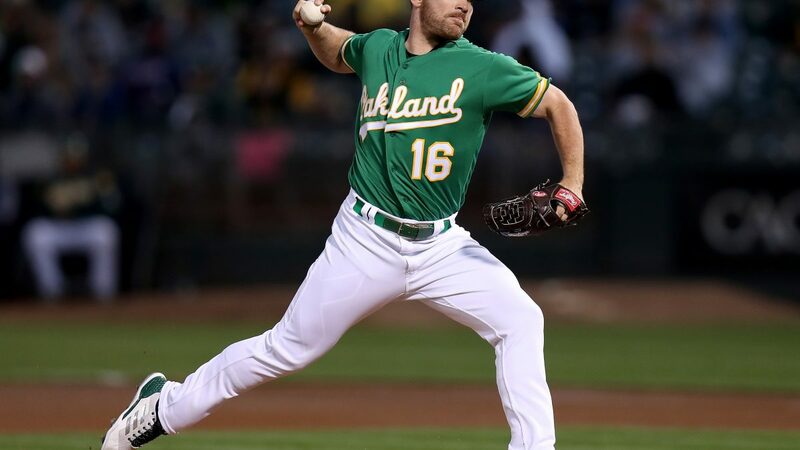 45, off Twins reliever Matt Magill (L, 3-3, 4.00 ERA), to a nearly identical location nine innings later once again proving to be the provider of power in “Hero-Town,” as the ads placed all over Oakland would suggest. The stories between those bookends featured much trial and tribulation. Trivino, now at 72 innings this season, carried a 1.16 ERA through his first 45 appearances. 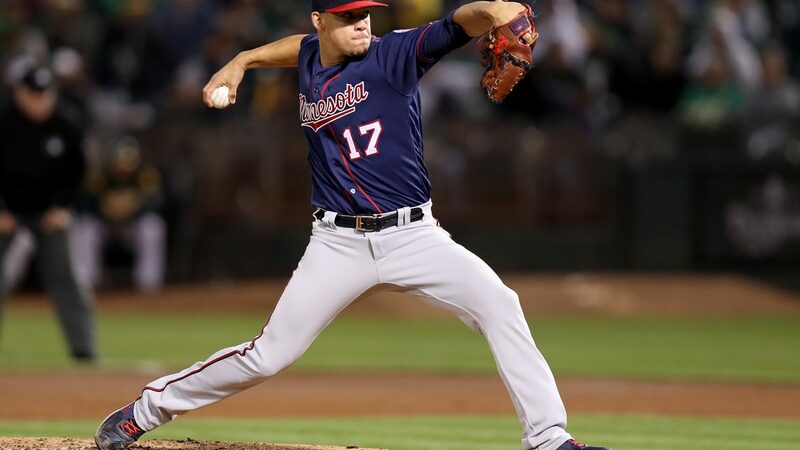 In the seven weeks, 22 games and 17-2/3 innings since, the rookie right-hander has allowed 17 runs, including four Friday — he had held opponents to seven runs in his 54-1/3 innings prior to Aug. 8. 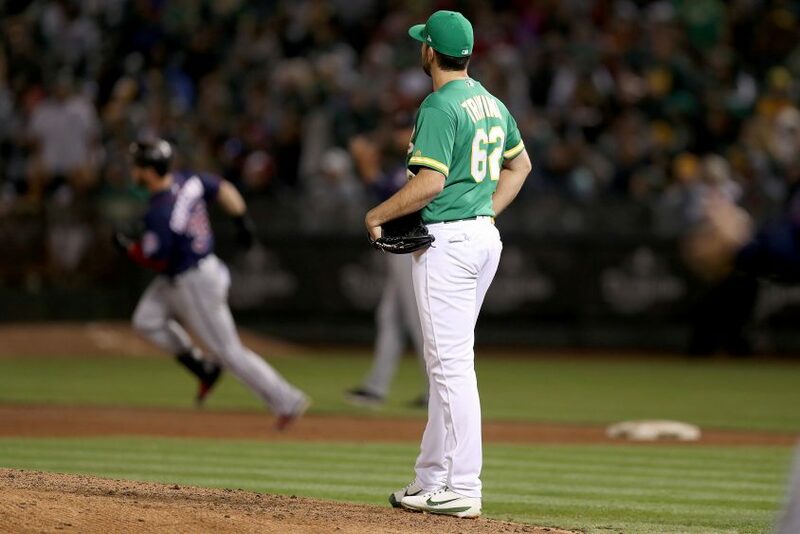 Oakland Athletics relief pitcher Lou Trivino (62) watches as Minnesota Twins left fielder Robbie Grossman (36) rounds the bases after a home run in the sixth inning as the Minnesota Twins face the Oakland Athletics at Oakland Coliseum in Oakland, Calif., on Friday, September 21, 2018. After taking over with a 4-0 lead in the sixth, Trivino allowed all four batters he faced to reach and eventually score. 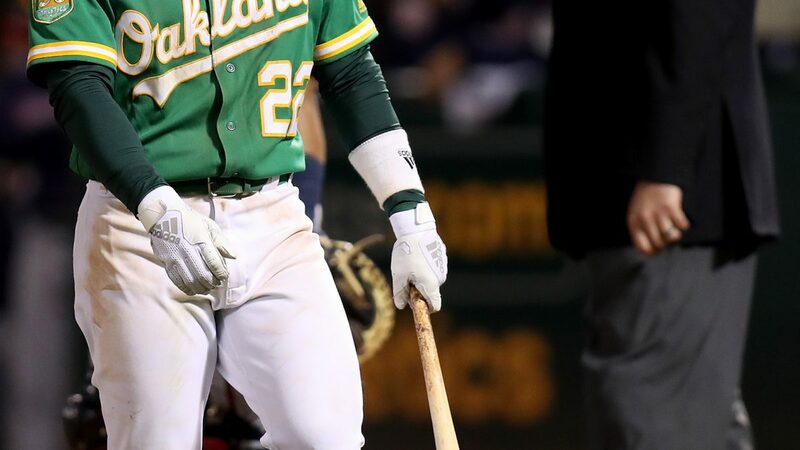 While the last two came in on a double surrendered by Shawn Kelley the first two were tallied on a Robbie Grossman homer (5), the fifth Trivino has served up since Aug. 8 after having been tagged for three before. 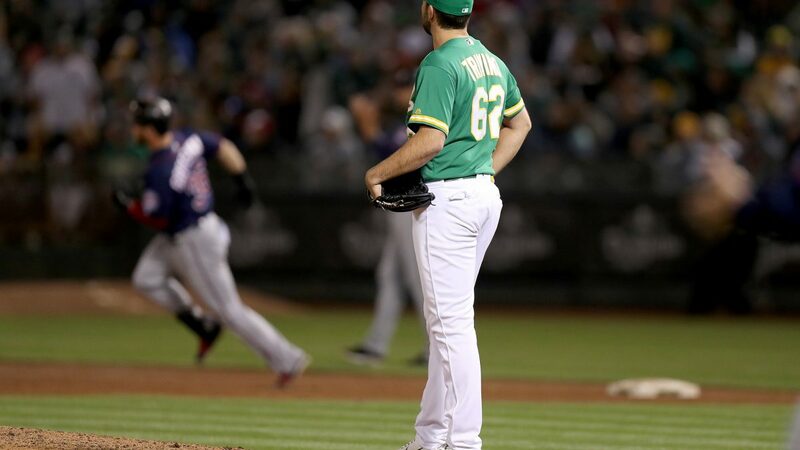 Including his 5-1/3 with Triple-A Nashville, Trivino has now worked a total of 77-1/3 frames. He last reached that high a mark in 2015, with Advanced-A Stockton, when he began the campaign as a starter. By the time Kelley put the finishing touches on the top of the sixth, Minnesota had turned a 4-0 deficit into a 6-4 advantage. But the advantage was short-lived. 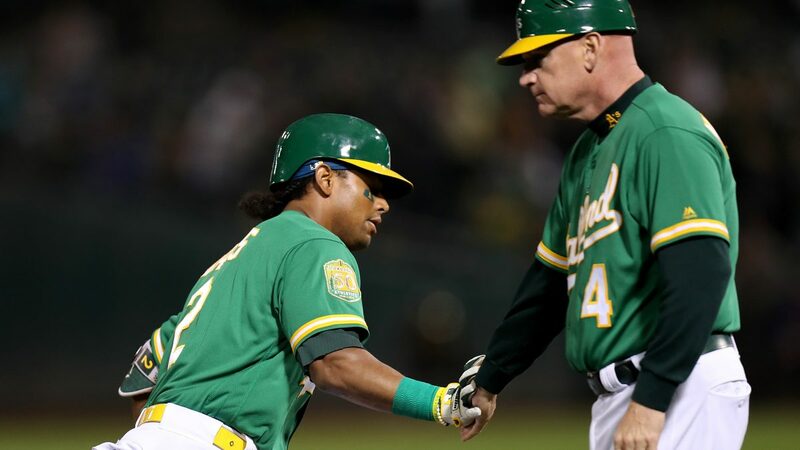 A decision by Melvin to pinch-hit Matt Joyce in the place of Jonathan Lucroy forced Twins skipper Paul Molitor to pull starter José Berríos (ND, 11-11, 3.93 ERA) in favor of lefty Gabriel Moya. 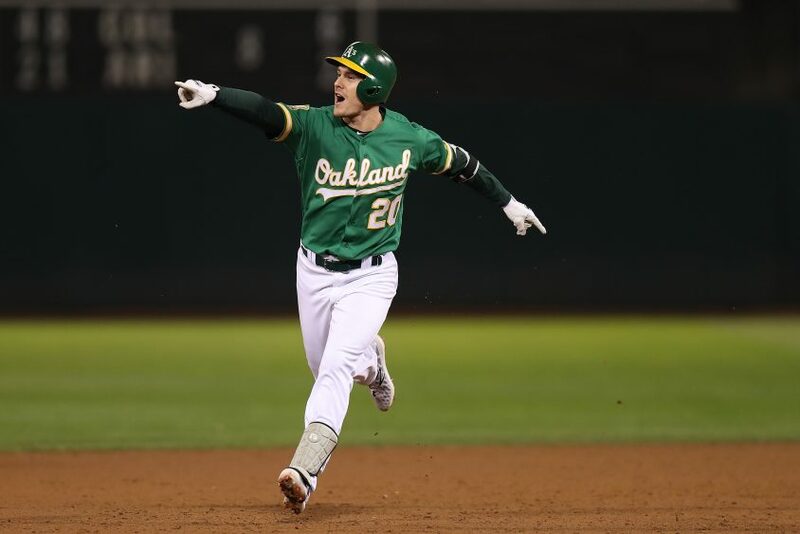 Instead of Joyce, Moya faced Oakland pinch-hitter extraordinaire Mark Canha, who promptly unloaded a game-tying two-run homer (17). Oakland Athletics first baseman Mark Canha (20) reacts after hitting a pinch hit two run home run in the sixth inning as the Minnesota Twins face the Oakland Athletics at Oakland Coliseum in Oakland, Calif., on Friday, September 21, 2018. Canha made sure Kelley wouldn’t be stuck with a loss, but the combined efforts of the two righty relievers erased a solid start to the game — another — by Liam Hendriks and Chris Bassitt. 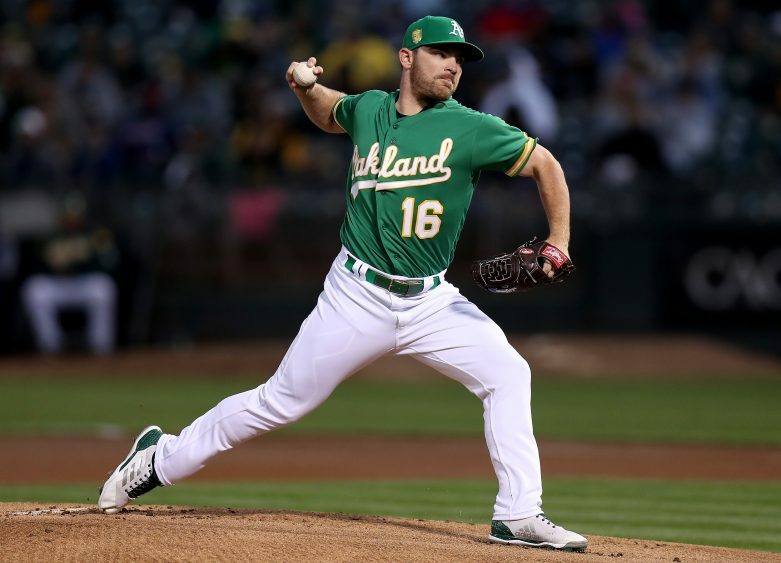 Oakland Athletics starting pitcher Liam Hendriks (16) throws a pitch in the first inning as the Minnesota Twins face the Oakland Athletics at Oakland Coliseum in Oakland, Calif., on Friday, September 21, 2018. 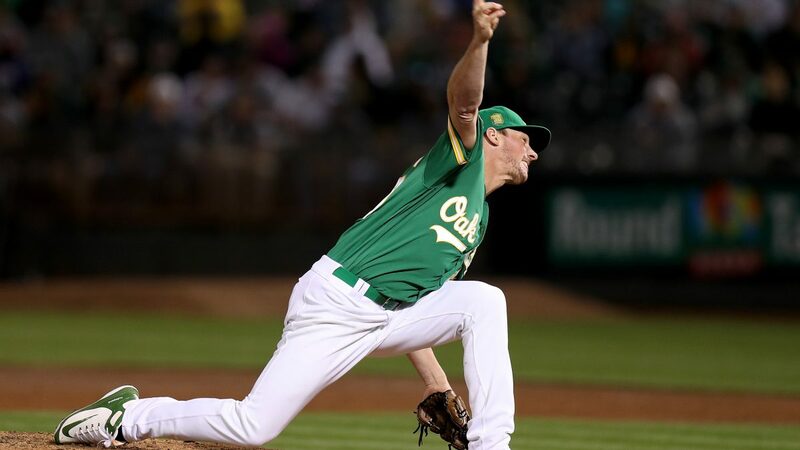 Hendriks, making his seventh opener start, once again posted a scoreless first inning, though this one came with a little more of a battle than the previous. It took the Aussie 28 pitches, but he worked around a walk, single and two full counts. And Bassitt followed with four scoreless on one hit with one walk and five strikeouts. 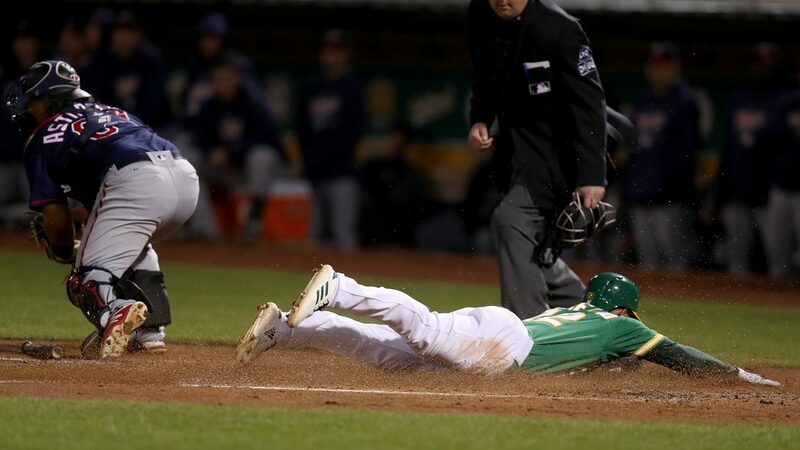 Blake Treinen (W, 8-2, 0.83 ERA) worked a perfect ninth and 10th to earn the win. 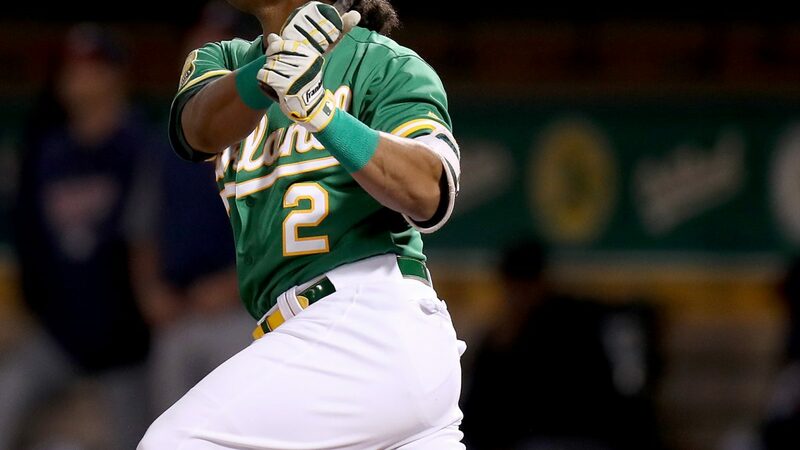 In doing so, he pushed his consecutive hitless inning streak to 13-1/3, two outs shy of the Oakland record set earlier this season by Sean Manaea. 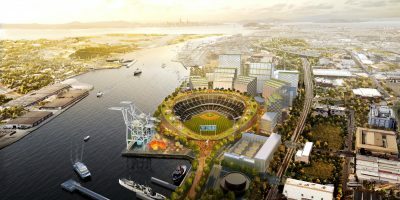 The beer-guzzling fan, who was no doubt a section celebrity by the time the night ended, found her way on the scoreboard again in the eighth, slamming a fourth beer. Then a fifth, in the 10th. 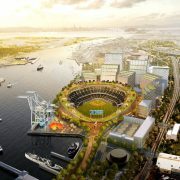 And while she was the one who received stadium-wide notoriety for her impressive exploits, Oakland fans by the thousands will likely be joining her in the libations once the A’s clinch a playoff berth — their magic number now stands at three. 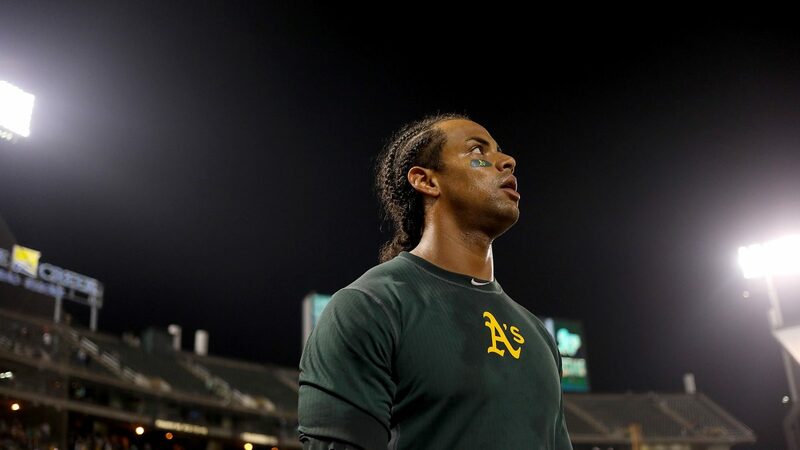 With a 10-8 victory over the Orioles in New York, the Yankees remain 2-1/2 games ahead of the A’s for the American League’s first Wild Card spot. 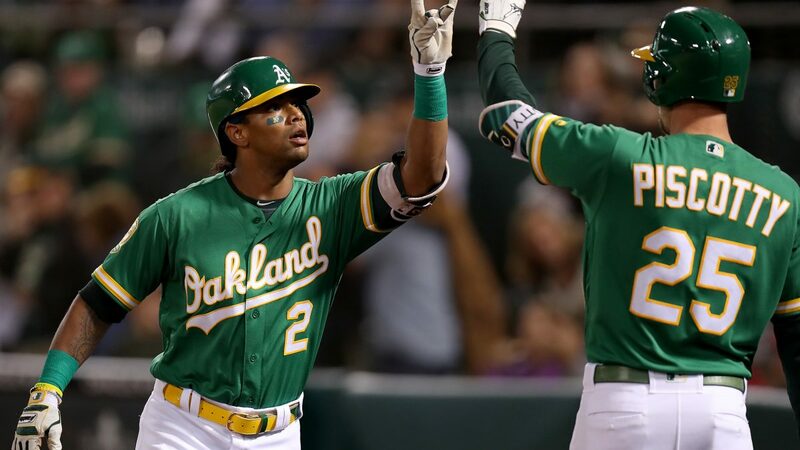 … The Rays bounced back from a rough loss Thursday night to top the Blue Jays 11-3 and stay 6-1/2 games back of the A’s for the second Wild Card spot. 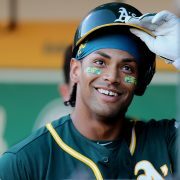 … The Astros clinched a playoff berth with an 11-3 win over the Angels, and maintained a 4-1/2-game lead over the A’s in the race for the AL West division title. 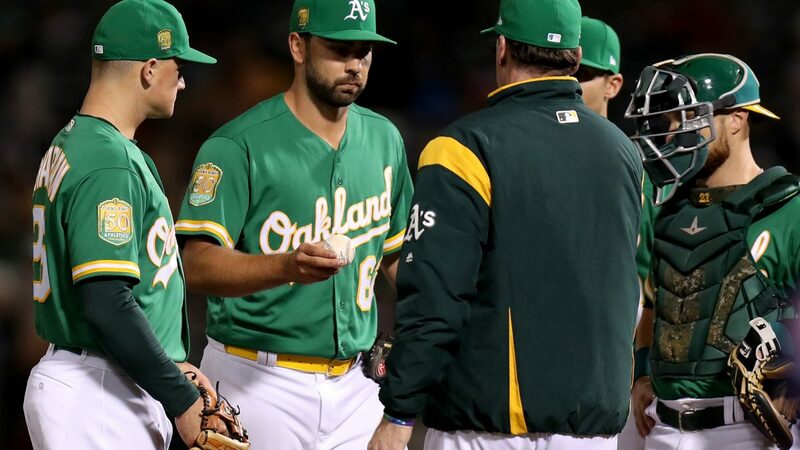 Fresh off his first loss as a member of the Athletics, Mike Fiers (12-7, 3.38 ERA) takes the hill Saturday night as the A’s look to keep their hopes of clinching a playoff berth at home on Sunday alive. 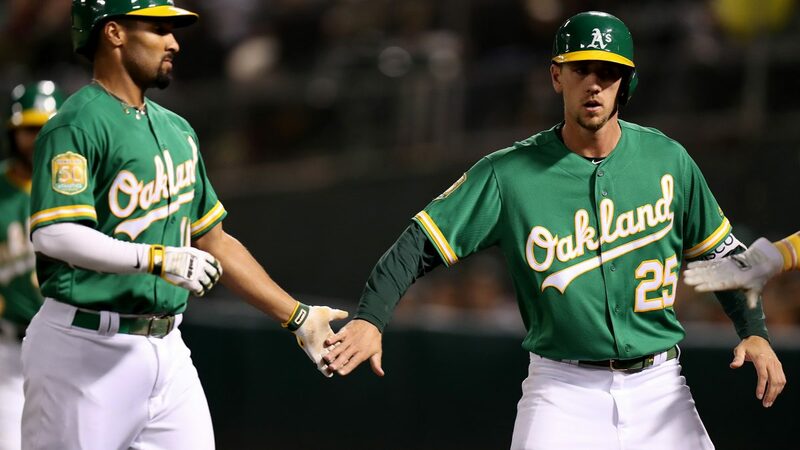 Minnesota will oppose Fiers with right-hander Chase De Jong (0-1, 3.68 ERA), in search of his first big league win. 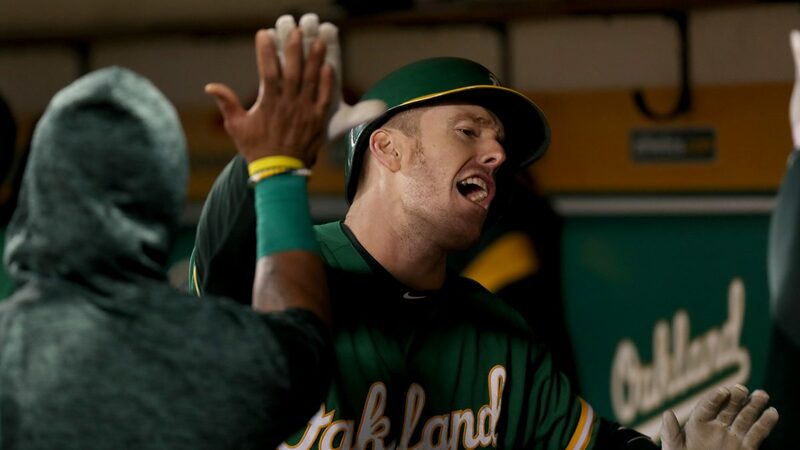 Mark Canha’s pinch-hit homer in the sixth gave him a career high 17 on the season. 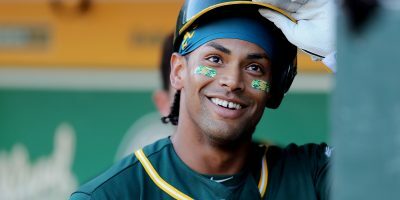 His previous career high of 16 was set in 2015, his rookie season. 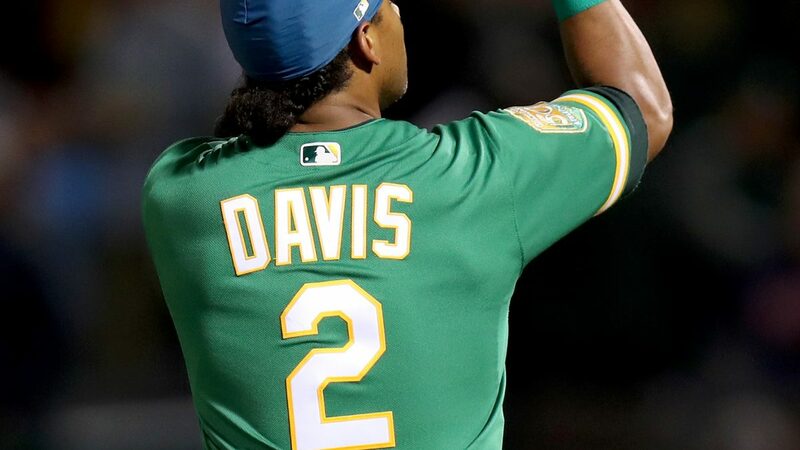 … Friday marked the 22nd multi-home run game in Khris Davis’ career, his seventh this season. 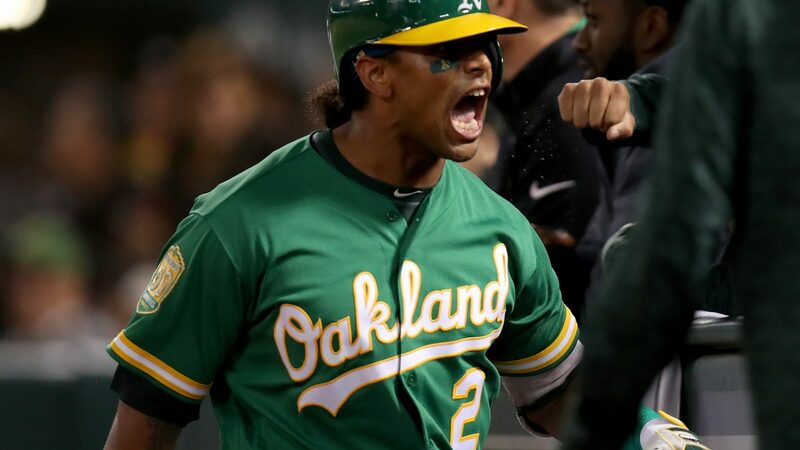 It was Davis’ fourth career walk-off home run.